Just as it is abnormal for a part of our human body not to be connected to the rest of the body, so in the Body of Christ "connectedness" should be normal Christian living. The NASB version of the Bible translates Romans 12:5 to say that we are "members of one another" which suggests that an interdependency should exist among believers. Each phrase in this verse richly demonstrates truth about our connectedness with one another. We are connected to people, not to an organization, program, or structure. This is a relational commitment. The phrase "one another" is from the Greek word "allelon" which denotes a reciprocal and mutual work on the part of believers toward one another. In the process of being connected with one another we maintain our individuality. Teens are still teens. Adults are still adults. Men are still men. Women are still women. Each of our personalities remains intact. We do not become less of who we are in the process of becoming one with each other. To the contrary, we are enhanced as each age, gender, and temperament brings into the body a greater balance because of what each one has to offer. Unity comes out of diversity. Although we are one body, we do not all look the same, act the same, or have the same function and gifting. The fitting together of individual parts results in unity. Our life together with all of our differences is something better than if we remained isolated or if we associated with only those who were the same as us. 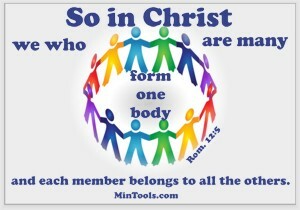 Unity is not due to external factors but because we all belong to Christ. Our relationship with each other is a result of what we share in common through Christ. The cross of Jesus breaks down barriers. He is our source and motivation for oneness. The church is made up of all believers, everywhere. We need to guard against isolating ourselves as individuals or as a local body. We are part of the whole. We are not alone. There are other people who also love the Lord and desire to serve Him. We can travel to the other side of the world where we are bound to run into other believers who we never knew before and still have that connectedness in Christ. Positionally, we are connected to one another in Christ. That is a fact. The question is, how can we better demonstrate this connectedness? You will find some suggestions in the Body Life Ministry Manual.